The first Sunbeam car was produced in 1901, and used a Peugeot as its basis. 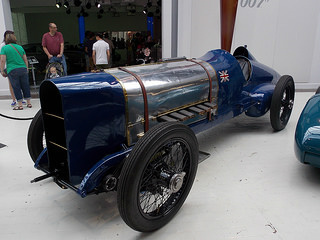 In 1920, Sunbeam went into sports car racing, and their car ended in second position in the 1925 Le Mans race. Since racing was expensive, and they had not been paid for WW1 work, the Company went into receivership in 1934. In 1935, the Rootes Group purchased the Company. In 1938, Rootes introduced a brand new marque. They decided to call it the Sunbeam Talbot, which brought together the desirable Talbot coachwork with the chassis of the Hillman and Hunter. 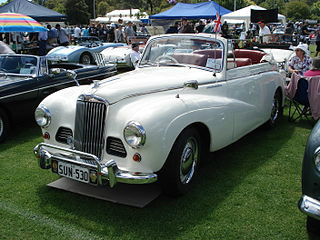 In 1950, the Sunbeam Talbot Mark 2 cabriolet was introduced. It used a 2.3 litre overhead valve engine developing 70 bhp. In 1952, a Mark 2A drop head coupe was introduced, and the higher compression engine produced 77 bhp. In 1954, the Mark 3 included a two door drop head coupe, and power from the 2.3 litre, straight 4-cylinder engine was increased to 80 bhp. A Mark 2 Sunbeam Talbot, driven by Stirling Moss, ended in second position in the 1952 Monte Carlo Rally. The 1955 Rally was won by a Mark 3 Sunbeam Talbot. In 1953, the Sunbeam Alpine Mark 1 was launched. 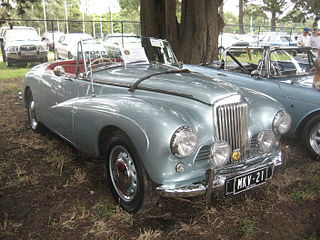 It was a two seater convertible, based on the 1952 Sunbeam Talbot drop head coupe. The engine and performance were unchanged. There was no Mark 2, but a Mark 3 version was introduced in 1954. Production ended in 1955 when a total of 1,582 units were built. 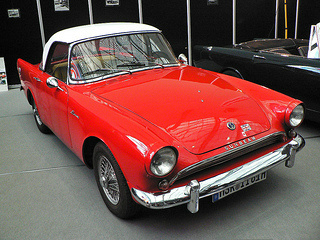 The Sunbeam Alpine Mark 3 was produced between 1954 and 1955. With a compression ratio of 7.5:1, it developed 80 bhp, and produced a top speed of 91 mph, with a 0-60 mph time of 18.4 secs. In 1956, the Sunbeam Alpine Mark 3 was completely redesigned with the aim of producing a pure two seater sports car targeted primarily at the US market. The final outcome produced a car with a more than passing resemblance to the early Ford Thunderbird. 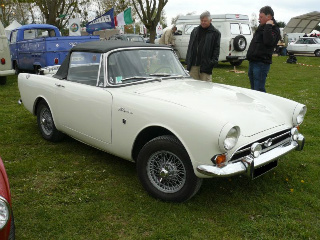 Hence was born the restyled Sunbeam Alpine sports car which, between 1959 and 1968, was produced in five separate series. 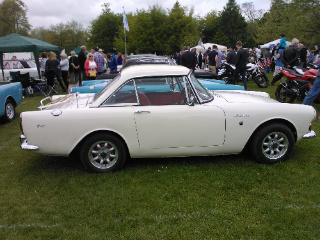 In 1959, the Series 1 Sunbeam Alpine sports car was launched. It was a two door convertible with optional overdrive. Now with an aluminium cylinder head, two Stromberg carburettors, and the compression ratio increased from 8.5 to 9.2:1, it produced 78 bhp at 5000 rpm, and 89 ft/lbs of torque at 3400 rpm. 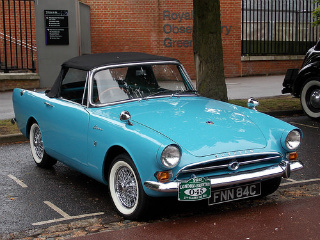 In 1960, the Series 2 Sunbeam Alpine was introduced, with the engine capacity increased from 1.5 to 1.6 litre. With its slotted alloy pistons, it now generate 80 bhp at 5000 rpm and 94 ft/lbs of 3800 rpm. It retained the distinctive rear fins of the Series 1, since it was specifically targeted at the US market. 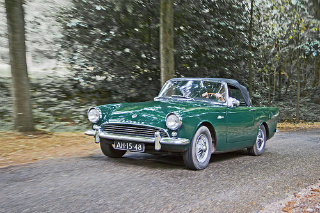 In 1963, the Series 3 Sunbeam Alpine sports car made its appearance. It was offered as a convertible and a fixed head coupe with a detachable "Surrey" hardtop. An occasional rear seat was fitted. The two Stromberg carburettors, from the Series 2, were replaced by a single Solex unit with a large, single, air cleaner. This resulted in a reduction in output from 80 to 77 bhp, and a reduction in torque from 94 ft/lbs to 92 ft/lbs. 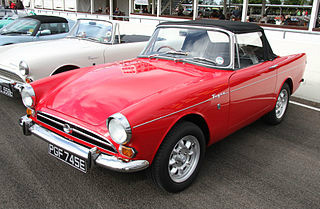 In 1964, the Series 4 Sunbeam Alpine sports car was introduced, and the convertible and hardtop versions were retained. Since the distinctive rear fins were now regarded as old fashioned, they were replaced with fins drastically reduced in size to provide a softer and smoother image. The engine was now fitted with a single Solex twin choke carburettor, which increased output to 82 bhp at 5000 rpm, and 95 ft/lbs of torque at 3500 rpm. 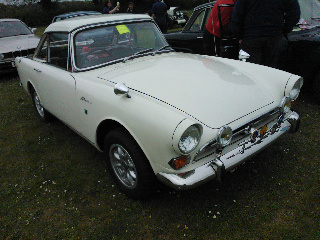 1966 Sunbeam Alpine Series 4 Nice! 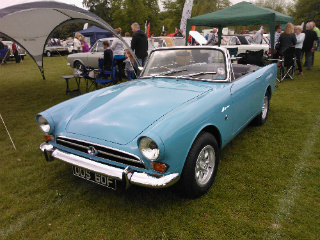 In 1965, the Sunbeam Alpine Series 5 sports car was launched. The engine was uprated to 1725 cc, with a 5-bearing crankshaft and two Stromberg carburettors, and now developed 92.5 bhp at 5500 rpm, and 110 ft/lbs of torque at 3700 rpm. Top speed now exceeded the magic 100 mph for the first time. 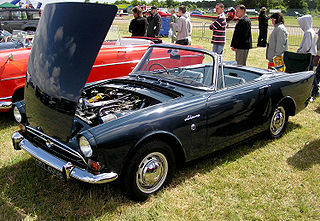 In 1962, it was obvious to Rootes Group that the Sunbeam Alpine required a more powerful engine in order to be successful in worldwide markets. 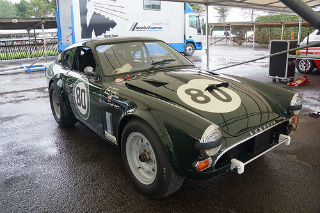 It was suggested that the Ford V8 unit, as used in the AC Cobra, would be an ideal candidate. After extensive development work, a method was found to "shoehorn" the massive V8 into the Alpine engine compartment. A contract for the production of the new car was given to the car maker Jensen. 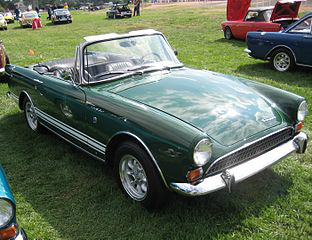 Hence was born the Sunbeam Tiger. 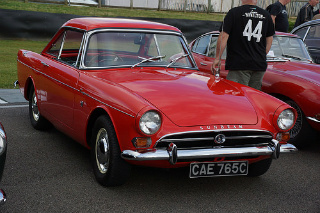 In 1964, the Series 1 Sunbeam Tiger sports car was launched. It was fitted with the 4.3 litre (260 cubic inch) Ford V8 engine and a two barrel Ford carburettor. This developed 164 bhp at 4400 rpm and 258 ft/lbs of torque at 2200 rpm. The main weakness was in the valve springs, which had inadequate tension, with the risk of seizure. All the cars built were shipped to the US, except for 56. It was not until 1965 that the Mark 1 was available in the UK. In 1967, the Series 2 Sunbeam Tiger sports car was launched. It was fitted with the 4.7 litre (289 cubic inch) Ford V8 engine, with the compression ratio increased from 8.8 to 9.3:1. Apart from a larger engine, the car remained unchanged. Officially, the Series 2 model was destined solely for the US market. In 1967, owing to mounting losses at Rootes Group, it was forced to agree a takeover by Chrysler. However, the new owner wanted its own V8 engine in the Tiger, and not that from its competitor, Ford. Unfortunately, the Chrysler V8 engine would not fit into the Tiger and so, in June 1967, production of the Tiger Series 2 was halted. Got any stories about Your Favourite Sunbeam Sports Car?